If you're not using video to drive traffic to your websites you're at a real competitive and perceptual disadvantage because many of your competitors are. Are you being left behind? Video marketing is much easier than most people assume. Video Marketing Secrets puts all the puzzle pieces together for you in easy to follow, step-by-step fashion. You don't even need to know how to make videos right now—this video course shows you how to make your own traffic-grabbing videos using completely free software. Video marketing is a dual strategy, having both short term and long term benefits. It can bring traffic right away, and for years to come. Siphon highly targeted traffic directly from the wildly popular YouTube and other video sharing sites. Get link juice from the websites Google and other search engines consider very important. Reach people who prefer video to reading—placing your site where the traffic already is, is crucial. Crank up the sales volume for your products, or affiliate products, with the targeted traffic you can get. Connect with your visitors better because they won't be just random visitors, your video will set the tone. Video Marketing is Smart Marketing! Video marketing is smart marketing, not only for the targeted traffic and link juice, but because you can recycle old content you've already used and put it into videos to get fresh and lasting results from it. Recycling content is extremely smart. Why create something once and get nothing else from it beyond the original use? By recycling your content into videos and PDF's (see video 5) you'll multiply the results you get from it. Turn Your Content Into Cash! Video Marketing Secrets is a $27 value. I'm including my ebook, Turn Your Content Into Cash, at no extra charge. I sell Turn Your Content Into Cash separately on this page for $17, but it's yours free with this video course. 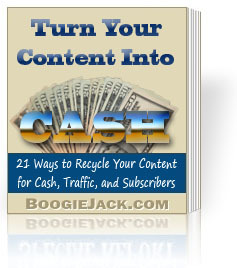 In Turn Your Content Into Cash you'll discover 21 different ways to recycle your content for cash, traffic, and building a mailing list. The hardest, most frustrating thing for nearly all webmasters is getting traffic. They keep "fighting the good fight" but aren't winning the war. That's because they keep doing the same things over and over! Most webmasters keep doing exactly that! They keep doing the same old things and getting the same lack of results—but they keep on trying. No wonder they are frustrated. I hate to see people keep wasting their time on unproductive traffic generation strategies. There are unspoken hopes and dreams behind each person's website. 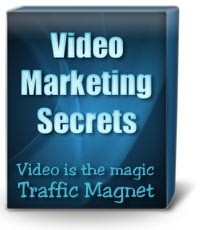 Get Video Marketing Secrets now and break that chain of traffic generation failure. Yes! I want to discover how to create videos that drive traffic to my website. I understand I'll also get Turn Your Content Into Cash, a $17.00 value, completely FREE as a bonus. Just $27.00 if you order now! PS - You'll be able to watch these videos online anytime from the Video Marketing Secrets member page. This is cool, and so easy. This video gives you an overview of video marketing. This video walks you through the two key preparation steps: keyword selection and how to find free content (of course, you can write your own content too). These steps are NOT difficult, but they are necessary. This shows you where to get the free software to make a video and how to prepare the content for a simple video. That's right, you'll be using free software. There is nothing else you have to buy. This is the simple step-by-step process of creating a video. It's really much easier than most people think who haven't done this before. You'll also learn how to add your video to YouTube, the king of video traffic. The first four steps is all you need, but this step shows you how to repurpose the exact same content you prepared for the video into a PDF document and where to distribute it. In only takes minutes and you'll be able to add important new traffic sources and links to your site. This video wraps it all up and shows you how to add hundreds of new links to your site using the content you've already created.